Sunday night is roast night in our house. It alternates between chicken, lamb and beef, and the veggies vary depending on what's growing in the garden around lunchtime each Sunday. But one thing that never varies is the gravy. My family love gravy on their roast so I always make a big jug for them to just about drown their dinner in. Making gravy from scratch couldn't be any easier and it tastes so much better than from a mix, once you've mastered it you'll never resort to gravy powder again. All you need are the pan juices, cold water, plain flour and some seasonings of your choice. Traditionally gravy uses the pan juices from a roast, but it you fry steak or rissoles or sausages you can use the pan juices from them to make delicious gravy too. Step one: Remove the roast from the baking dish or meat from the fry pan. Step two: Put the baking dish or frying pan on top of the stove. Step three: Mix ½ cup of plain flour in 1 cup of cold water. I shake it in a Quick Shake to make sure there are no lumps. You can whisk it in a jug or a small bowl for the same lump-free result. Step four: Turn on the heat under the baking dish (or fry pan). When the juices start to boil add the flour and water mixture, stirring constantly. Make sure you scrape all the brownings off the edges and bottom of the pan, these give the gravy a beautiful, rich flavour. Stir in a splash of Worcestershire sauce and stir until the mixture thickens. If it seems too thick you can always add more COLD water (hot water will cause it to lump and go gluggy), stirring all the time you're adding the water. Step five: Add salt and pepper if needed, taste it first. Skim or pour off excess fat if you want to. Serve. Good gravy cannot be beaten. It is the secret to finishing off a good meal. 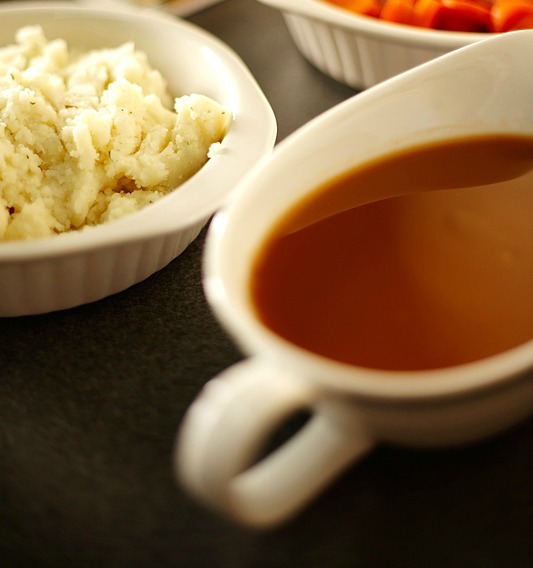 Leftover gravy can be used to thicken pie fillings, added to soups, stews and casseroles and even re-heated and poured over toasted muffins for a quick lunch or breakfast. Oh my gosh this looks amazing! I loooove gravy! The first thing my mother taught me to cook was gravy! She always removed the meat and veggies from the roasting tin, drained off any excess fat (dripping in those days! ), leaving a small amount in the pan. Then the flour was stirred in and the mixture cooked on the stove top till thick and brown. Then the liquid was added and stirred very well. We always used to use the water that the green veg had been cooked in to make a very tasty gravy. Thank you! I haven't done roasts (or not since the oven at the old place worked, which must be 15 or 20 years ago and I was only old enough to help Mum with some steps), and I was wondering how to get the meat juices. Fried sausages work! Yay! Even if I save it for another, I am always going to make it when I have sausages from now on! I make the gravy straight into the frying pan when we have sausages or rissoles - no need for a separate saucepan.